I wondered if the cards were buried in a rubble of loose cards somewhere never to be unearthed - the misplaced cards maybe about a dime each, but I don’t want to feel incomplete and distressed about my collections not being in order to the point where I can't find the most obscure cards. I may have squirreled the cards away in one of my ‘silly’ loose card projects like perhaps my off-season transactions mini-collection - maybe in a random group cards I've pulled to list as part of one of my mini-collections. 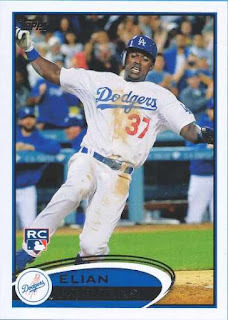 The Herrera cards were just not in the obvious places, but I ended up flipping through random cards I stuffed in a 3200 count box of cards - when I actually spotted Herrera’s cards in a small, miscellaneous grouping of loose cards and found the following, one 2012 Topps Update Series #US38, the two 2012 Bowman Draft #51 cards I was originally whining about and a 2014 Topps Update #US-30. 'Loose card projects' is my catch-all term for the mini-collections I'm trying to put together [collecting topics, Angels frankenset, Topps year-to-year run, etc] from the assorted cards I've hoarded - these various projects is what I end up tending to as far as playing with cardboard is concerned. One of these projects is a collection of 500 home run club members - I thought about collecting autographs of the exclusive statistical mark, but the idea of needing to secure Babe Ruth's autograph [714 home runs] is just not possible. 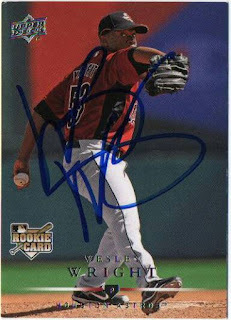 I've probably got assorted autographs of the non-vintage players - though nothing like signed baseballs for each guy. I thought about picking up a 'premium card' for each player - though at this point I want to make this initial set of cards a starter set to upgrade and build on if I wanted. 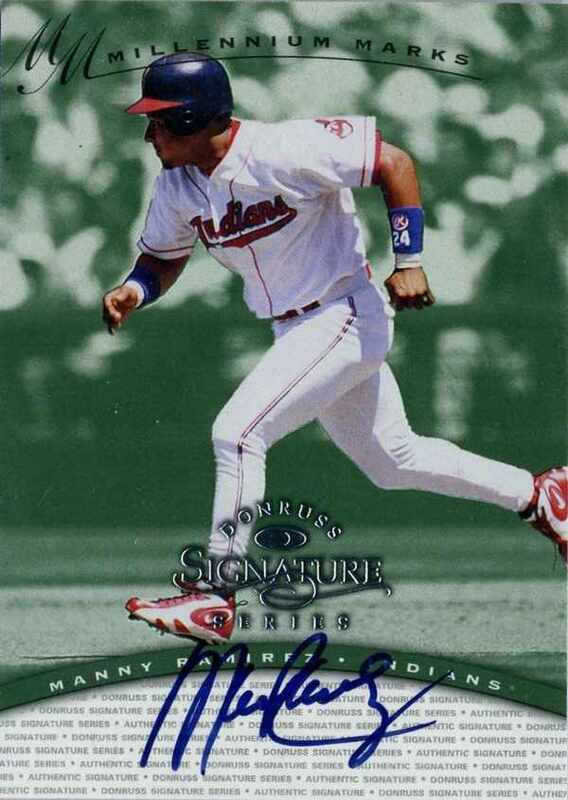 The hype surrounding 'Manny Being Manny' and 'Mannywood' has been long over - though I still remember the flaky but ferocious slugger from his early years with the Cleveland Indians through his prime years with the Boston Red Sox. In recent years, Ramirez has tried to hang on as a player, even spending time playing in Taiwan in 2013 - as is, he is a ‘has been’ whose Hall of Fame caliber hitting stats clash with PED allegations / suspensions. The guy was moody about signing and the way he signed his autograph is all over the place - I was 'browsing around' for random subjects and picked up a certified autograph card with a scribble that is cleaner than the chicken scratch he has inked up. Basically Junior Griffey was probably at the top of the MLB world just behind Mark McGwire and Sammy Sosa back in the late 1990s - the way I remember it, I was in my first year of figuring out this auction Web site called eBay and was looking to secure a copy of Junior's first Topps card in the 1989 Topps Traded set. There was a 'bunch of them' listed in a dutch auction [?] and there were multiple bids on each one, though no picture - I figure I'd get in on the action, so I was going to bid on one to win it. For about $15, I was going to get a Junior card and unlike in 2016, card prices were still a bit inflated just because Junior was in his prime and not everyone knew to get online to try to sell cards - I think the card was shipped in a plain white envelope, but the kick in the groin came when I saw the card shipped to me was a common card [#40T] of Ken Griffey Sr. I was pissed off and disappointed at the fact I probably had no recourse - I did not even think it was possible that there would be a 'Sr.' in the 1989 Topps Traded set and my trigger finger got the best of me. I probably thought any Piazza cards I could find back in through the mid 1990s were cardboard gold - with his Hall of Fame election this week, I can't help but think this card is my favorite random Piazza card from the last 20 years. Just for old time's sake, I'll probably dig the card out though I don't know if the card is still in 'functioning' condition - because of the warm So. Cal weather, there are times where the card has looked like this without being touched. 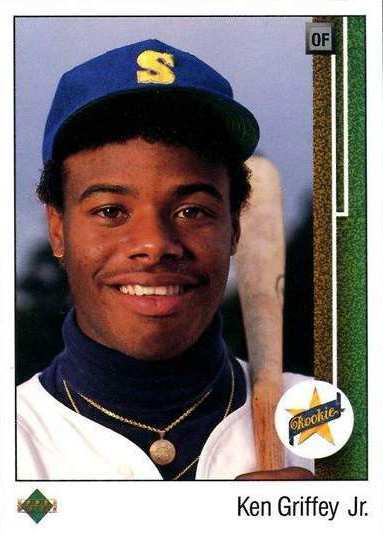 Knowing the Baseball Hall of Fame announcement was coming up, I picked up a nicer version of Griffey Jr.'s iconic rookie card - I was worried the card would get a little ‘artificial’ bump and wanted to upgrade the ‘raw’ copy I must have picked up 10-15 years ago. My favorite Griffey Jr. rookie card would probably be my first, which is his 1989 Donruss, but the Upper Deck was the one to have - I've read random blurbs posted on card forums about UD running the presses to make this card to order, so I had reservations about putting a premium on the card as a legit pick-up for the personal collection I’m trying to build up. 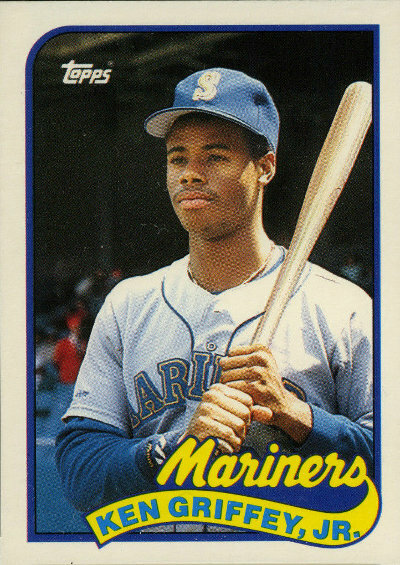 Regardless of apparent overproduction however, the 1989 UD itself has had a legacy on its own among collectors and now that he's been elected with the highest vote percentage - it would probably make the card even much more of a hassle to pick up, just to have one that is a bit cleaner than the one I've had. 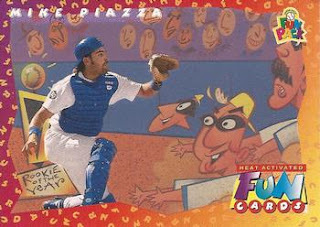 As far as Piazza goes, I've got to dig up the 1992 Fleer Update card I picked up at some point when either towards the end of his career or several years after he retired - unlike Griffey Jr., who had a graceful swing and was a great athlete, there was no subtleties in Piazza's game as he was a slugging beast who put up monster numbers as a catcher. 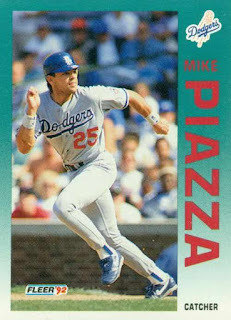 Regardless of the era Piazza played in and the innuendo [Murray Chass and bacne] and actual drugs [Vioxx, Andro, greenies among others] he took to be a dominant player or just to be able to play through a MLB season - I think his election to the Hall of Fame validates Piazza's accomplishments as a major leaguer. For the card related projects I’m working on, I’ve gotten a little crazy trying to create and/or update Google Sheets and/or Google Docs files - I think it gets the ball rolling as far as getting organized and seeing what I have / need. Angels autograph wantlist [Google Docs] - trying to list out players I still need...will create a Google Sheets file to account for the autographs I already have. 2016 collecting topics worksheet [Google Docs] - place where I list out the cards I can pull from my collection and also ‘new’ cards I can seek out. To do list [Google Sheets] - I’ve probably sought to create various incarnations of a ‘to do’ list, but I want to look at something like a concise ‘set of plays’ to run through. Regional collections [Google Sheets] - consists of my team A-Z singles and my PC cards. 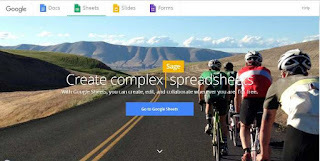 A-Z singles [Google Sheets] - I want this file to use as a spot to list out applicable cards. Angels Opening Day starters [Google Sheets] - I’ve gathered some assorted cards and intend to list them out. Wright is your basic LOOGY who ended up getting into 9 games for the 2015 Angels - according to his agency's Twitter account, he signed a minor league deal with the Arizona Diamondbacks and will likely be joining the team in spring training. I kept my 2015 trading card collecting goals offline though here they are and my comments after the fact - through the summer of last year, I was pretty much content to neglect my interests in strictly trading cards wane as I other things in-hand to preoccupy myself with. However when times were uncertain and I was kind of feeling aimless about collecting anything - I needed to re-focus my energy on cards as a hobby to care about again. My assorted goals generally reflected my interests over the last several years - but I think it was only in the last three months of 2015, there may have been an effort to put life back into collecting just the cards for themselves. A.) I'd like to put together a list of Top 30 PC cards in my Angels collection - by the end of the year, I want a collection of cards to showcase i.e. a wrinkle is while these cards should be centerpieces to my regional collection, value isn't going to be the focal point, but having a list and a physical grouping of cards to work from. B.) Account for an A-Z singles collection - list in a database and have a physical place to store the cards in. C.) Account for an insert collection of Angels - basically list cards in a database and be able to put away in binders. D.) Account for loose Angels cards - my goal is to have a binder of random Angels cards as a 'jukebox' of sorts; cards that go into this collection should be listed in a database. A work in progress, I want something ‘regional,’ though I might want to just wean myself off being hard up for a team. Having an Angels ‘Top 30 PC’ seems a little hazy...maybe the 2016 goal will be to build up my A-Z collection first, then hope to identify cards that make up a more definitive PC. With regards to inserts, try to prune out and separate though actually listing and putting them away seems a little more tedious. I’m not a completist, so with my loose Angels cards, I ended up starting an Angels frankenset; I feel good I’ve done something with my random Angels cards as a ‘jukebox’ of sorts; next year maybe I’m for completion of the first 500, set myself up for an ‘update’ set past 500 and as a new project, maybe work on Opening Day lineup collections - 12/21/15. B.) I want to store various singles in top loaders in a box, list in a database and file away - organized mostly by player in 'ABC' order and then possibly by card type i.e. basic rookie cards, parallels and certified autograph cards. 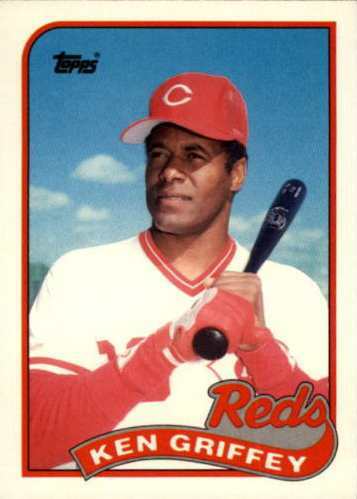 * Rookie cards and rookie year parallels - I want to put together a 'default collection' but find the MLBPA Rookie Logo cards to be junky, so I don't know if I really count most as good enough to be 'A-Z singles' worthy cards. A work in progress, it hasn’t really come together where I’ve gathered cards up, listed on a Google Sheets file and stored away. A goal would be to have a working A-Z singles collection - 12/21/15. A.) Maybe find a better physical place to store my various PC collections - use boxes I've bought. B.) Continue to add to my various PC collections - of course, I want something modern, blinged out, but also I'm not looking to bust a budget. My Top 30 PC cards should feature my most prominent 'value' cards - I want to say this collection will be the easiest to sell off even though the values may fluctuate over time. My Top 30 alternate PC cards - maybe a collection of cards that maybe an extension of my Top 30 PC. My Top 50 common PC cards - a collection consisting more of 'rank and file' keepers with some 'gems' I may have not ranked among the first two collections listed. Top 50 fun PC - maybe the idea of a 'fun' PC becomes a little absurd when the state of my 'serious' PC collections are just a little thin all around. The thing with this is realigning the collection physically and being able to add a few cards when I can - 12/21/15. A.) List all insert pulls in my insert database - sleeve the cards and put them away by team [INSTEAD OF PUTTING RANDOM CARDS IN A BINDER, MAYBE I SHOULD JUST LIST THEM, PUT THEM INTO SLEEVES AND BOX THEM UP; MAYBE EASIER TO PULL AS TRADE BAIT]. B.) Regional - make space for assorted Angels inserts [to be sorted by prominent players and random players]. My inserts collection is dormant though it’s basically upkeep such as listing cards I’ve picked up and finding something to do with the collection. With my assorted Angels inserts, I’m probably going to make it so cards at my discretion will be used for my Opening Day project and/or frankenset - 12/21/15. 5.) 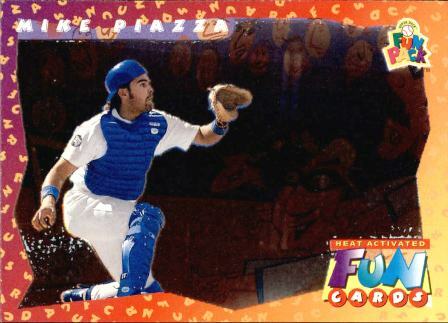 Collecting topics [1/5/14] - maybe not so subtly, I kind of what to make these cards the focus on my sports card collections. TAG any cards with either old-school [pre-1980] and/or vintage [pre-1973] on the comments field - to keep track of achievements with old cards. I counted out 1258 adds for 2015 with 3 old-school adds and 28 vintage adds, so I met goal of adding 500 new collecting topics cards, though fell short of the 250 old-school/vintage adds - 12/21/15. B.) I'd like to have more cards for collecting topics that seem to be underrepresented - so maybe try harder to find and add at least 20-30 cards to certain topics i.e. broken bat shots, interesting backs, retro uniforms, inking it up, cult baseball players / feats, beyond the glory and uncorrected errors. I guess the best way to figure this out is to look for the totals listed per each topic - then for the mini-collection that seem to have less, focus on checking up on the month 'adds' to see if I have added 20-30 cards. IT doesn’t happen where I really end up doing research to seek to list out a run of 20-30 specific cards to add to any particular topic and then seek them out - most of the time, I end up with cards from assorted breaks as opposed to picking them up as singles. Maybe in addition to whatever is pulled, I can do a better job of having a run of 20-30 specific cards to seek out - especially for the underrepresented mini-collections - 12/21/15. C.) Find and list 20-25 new subjects for topics that go on and on - nations, bloodlines, local guys, infamous, PEDs. I guess the best way is to figure this out is to sort using filter by monthy 'adds' for these five collecting topics - I maybe missing more mini-collections that apply, but at the very least, look for the following as far as new subjects. D.) For ‘bloodlines,’ try and complete at least ‘10-15’ relationships in a given year [knowing there maybe others along the way] - i.e. find the son, the cousin, the father’s card to go with what I may have in a collection already. Maybe do a post on the blog to showcase relationship - as well as the cards in-hand. E.) Scour loose signed cards and list at least 100 as adds to my 'collecting topics' tree - it maybe the easiest way to find use for signed in-person cards that I get signed since they all just lay around loose after. Maybe anything I add to a mini-collection can be added as a 'new card,' since it technically is new element - not just any old card. I haven’t done this because it seems like the cards I’m getting signed are running away from me as opposed to ending up in one stack. Many of the cards I might be using are of rank-and-file players and maybe I should embrace the idea some of the signed cards are going into mini-collections as opposed to really just ‘hanging out’ loose somewhere - 12/21/15. I haven’t thought about this but the idea is to have cards for my star-on-star mini-collection, especially if the actual player listed in the card is as good as the star making a cameo as opposed to being a scrub - 12/21/15. 6.) Finish my Topps team runs and my Topps sampler runs from 1978 to 2015 [1/5/14] - it's not really something I've been seriously working on, but I'd like to knock out a bunch of years and complete at least a couple of MLB teams. A.) I made a Google Sheets file so I can list all cards I have in my collection - maybe last opportunity to tweak a card used for a particular year. B.) Complete at least one division in 2015 - get to within about needing only 10-15 cards per each MLB team. This is in progress and while the project was once left dormant, I put some life into it by finally seeing what cards I was still missing and making use of the Google Sheets file I created. As for specific goals in 2016, maybe have a more concrete list of cards to chase after - get the years 1978-85 done for all the applicable teams and get 10-15 teams entirely done - 12/21/15. 7.) Reboot my award winners [MVP, Cy Young and Rookie of the Year] collection [12/29/14] - it's not really something I've been seriously working on, but get a new binder for the cards, make sure I at least have a card for each award winner from the last three or four years covered, make sure I have appropriate cards for certain players and see where I can add a new card to fill a hole. I’m pretty proud of myself I was actually breathe new life into this project, though it wasn’t really towards the end of the year. The project has been rebooted and hopefully I can nail down some more missing names as well as add some wrinkles i.e. relic/autograph cards along the way - 12/21/15. 8.) Find semi-permanent storage solutions [1/5/14] - have a system in place where I’m not juggling around loose cards, but have storage answers that are viable and maintainable. A.) If at all possible, look to 'double up' on the protection - don't leave things out in the open. B.) Don't leave cards loose - have a plan to put away every card appropriately. A.) I'd like to be able to pick up 20-25 assorted singles - such as rookie cards, certified autograph cards and other inserts that maybe interesting. Are there any certified autographs I need as far as an impulse pick up? Probably not and most notable singles may come from assorted pack / blaster / box breaks, than seeking out specific cards. Maybe I could focus on regional singles - it doesn't have to be something that maybe worth so much. If I take a look through my assorted buys, I can probably put a listing together of 20-25 cards though they would be mostly ‘odds and ends’ as opposed to cards that really stand out. B.) Pick up 15-20 first-year autograph cards - I want some nice cards as just a card collector, but it doesn't seem realistic to go after prospect cards that are already signed when I'm trying to go for the players' autographs in-person. C.) I'd like to pick up at least 10-15 Angels prospect cards - who are the Angels Top 10 prospects / who are their top picks and can I get at least one certified autograph card and one certified autograph parallel of each of those players in a particular year. F.) I'd like to pick up a random card per month - something off-the-wall and completely random. G.) I'd like to bust four or five 'guilt free' hobby boxes - try not to buy into hype when boxes first come out but pull the trigger on a couple. I’m not sure if this one works at all because I try to pick up hand-collated sets most of the time - if I could do four or five, then I've completed this goal. I still like the idea of having a full box to bust though I mostly have to pick my spots - I stuck to mostly random blaster box purchases because it made more sense to get hand-collated sets as opposed to full hobby boxes [if I’m mostly looking for cards as opposed to pulls]. For pulls, maybe I’d rather be spent online to get random singles - as opposed to busting boxes, which seem so impulsive.